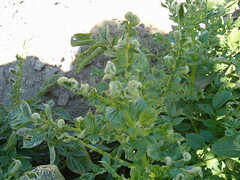 I just noticed in my potato patch some plants have their leaves curled. It looks like mostly the tips are curled up but I can tell something is wrong. What can I do for it? I don't mind using something strong if I have to in order to get rid of it...but if it is a fungus or virus, I think that would be hard to get rid of....??? Any ideas what I can do for it? Posting pictures is always helpful and/or you can take samples to your local agricultural extension for professional diagnosis. There are several viruses that can cause this. If that is it, you are probably out of luck and should just pull the infected plants to prevent it from spreading. However, it might be something like early blight, which is a fungus. Fungal infections in plants are more treatable than viral ones. Best case scenario, it might be a stress reaction in the plant. Lots of parts of the US are having very wet rainy springs. While that predisposes towards fungus development, it can also just stress the plant. If that is the case, if it dries up and the sun comes out, your plant might be just fine. Without more info and pics, I can't say which it is... Are there any other symptoms? Are the leaves crinkled? Is the plant stunted? Are the leaves yellowed or otherwise discolored? etc.. Did you check for aphids (which can damage the leaves themselves and can spread disease)? Hi Rainbow--no other symptoms have showed up. The leaves are curling up on the ends--I can't post a picture I'm afraid. But all leaves are green. Plants growing well. I just noticed the ends curling up today. Sometimes I wonder if it is worth it to have a garden with all the pests, viruses and fungas--I hope I don't have to pull up my potatoes. Doesn't sound so bad. I'd wait it out at this point. Take good care of them (healthy plants fight things off), don't over water, hope the sun comes out soon and maybe they will be fine. Hey, it worked!!! Can you see the curled leaves? Some rookie questions: blueberries, leaf curl, etc. Is there a white potato that grows good in Hot Weather? Pea leaf white spots spreading over pea leaves?